Famous for its archaeological importance and rich culture, Lepakshi is a popular tourist destination for those who want to imbibe the beauty from the historic past of our country. 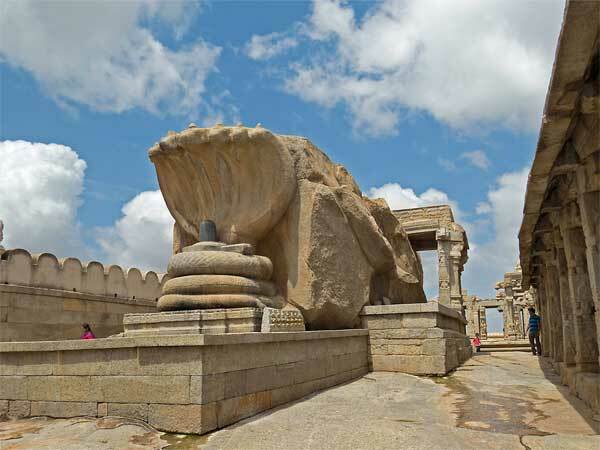 Located in Andhra Pradesh, Lepakshi is 15 km from Hindupur and roughly 120 km from Bangalore in Anantapur District. As an explorer of history, you can explore the ancient shrines of Lord Shiva, Vishnu and Veerabhadra. These shrines were built in 1336-1646 which was the period of Vijayanagara. Well known for the mural paintings decorating the walls of these temples, it is a treat to the eyes of people who appreciate art. Winter is the best time to visit Lepakshi because the weather is perfect for exploring the attractions. During summer it is too hot with the burning sun and heat at day time and warm nights which are uncomfortable, while during monsoon the place is too humid to enjoy a holiday. You must plan your visit to Lepakshi in between October and February, as this is the perfect time to enjoy outdoor activities of Lepakshi. The weather is perfect during this time. Also read: Nandi to Hanging Pillars: Catch Up With All at Lepakshi! You can experience the temperature from 15 degrees to 30 degrees in winter, which is great for tourists. The nights are cool and beautiful plus the days are comfortable for exploring the various attractions of the place. By Flight: The nearest airport to Lepakshi is located at a distance of 43 km, which is the Sri Sathya Sai Airport. There are a number of flights to the airport from Bangalore to Sri Sathya Sai Airport. From here, you can book a cab to your destination. It takes an hour to reach the Sri Sathya Sai Airport from Bangalore. By Train: There are no direct trains from Bangalore to Lepakshi. However, you can take a train from Bangalore to Malugur, which takes three hours. It is the nearest railway station to Lepakshi. You can reach Malugur first and from there you can take a taxi or bus which are frequent in the region. By Road: If you want to enjoy a road trip from Bangalore to Lepakshi, you can either take a car or a bus. A road trip gives an awe inspiring view and there are many beautiful stations which you will cross. There are many private as well as government buses which run on this route. The service of buses is frequent and it is quite cheap. There are many kinds of buses which run on this route. These buses are government buses, Volvo buses, sleeper buses, AC buses and semi-sleeper buses which are run by the government and private bus dealers. You will have to book the bus in advance to get a seat of your choice. You can hire a cab or take your own car for this journey. It will not take more than two hours in a car and you will enjoy driving down the beautiful and amazing villages on your way. However, we will recommend you to take route 1 because it is better and more beautiful. Route 1 will start from Bangalore to Hebbal, following the Sumangali Sevashrama Main Road and Service Road to Bellary Road in Vinayakanagar. The distance is 1.3 km and it will take roughly 5 minutes. After 9.8 km (12 minutes) of drive you will make an exit from NH44. Continue on this road for roughly 20 minutes and you will reach Yelahanka. Take Railway Station Main Road to SH 9 and continue on SH 9 to K.G. Govindapura. After 25.6 km you will reach Doddaballapura. From here, continue towards Nelamangala - Chikkaballapura/Tubagere - Doddaballapura Road and follow SH 9 to Gauribidanur. After 38.7 km take left at Vinayaka Mobile service and continue. You will reach Gauribidanur. From here, take east towards SH 9 and when you pass Rajeshwari Mobile's & Fancy Gift Center which will be on your left, take the left side towards Railway Station Road. After 2 km you will cross Om Shirdisai Common Bed Centre. After 2.9 km take a right turn and after 41 minutes and 24.7 km you will reach Hindupur. Now take 60 m north and take the 3rd exit onto Lepakshi Road after 19 minutes you will reach Lepakshi. On the way you can enjoy the beautiful and one of the biggest ISKCON Temples. If you want you can stop there and spend some time. You will also cross Visvesvaraya Industrial and Technological Museum which is an amazing thing you must not visit. Add some fun to your travel and stop here for some time. Later you will come across the Jayaprakash Narayan Biodiversity Park which is another place where you will love to stop and spend some time. For nature lovers, there is Lumbini Gardens on the way and you can relax there and have some tea and snacks on your way. There are three famous and beautiful yet small temples on the way which you should see. These temples are Saneeswara Swamy Temple, Basavanapalli Lord Siva Temple and Sri Venkataramana Temple. One of the major attractions in the place is the Lepakshi Temple. The temple is made up of rock carving in the Vijaynagar style of architecture and the best part of the temple is the hanging pillars. These pillars are the work of excellent engineering of the 16th century. It is said that when the British ruled India, they tried to find the secrets behind the mystery of these pillars, but they couldn't. According to the folklore, it is said that this temple has a significance in the Ramayana. According to which, it is believed that at this place the bird Jatayu fell. The bird was wounded because of the battle and he was carrying Sita, wife of Lord Rama. When the Lord saw the bleeding and wounded bird, "Le Pakshi" were the words which came out of his mouth. These words mean "Rise Bird" in the local language. Another must not miss thing here is the ancient artwork as paintings of Natya and Kalyana Mandapams which glorify the place. These mural paintings are the work of finest examples of the popular Vijayanagara architecture. Lepakshi is also known for its Veerabhadra temple, which is a famous temple of Andhra Pradesh. In this temple, the local deity Veerabhadra Swami is worshipped by the locals. Well known for its architectural beauty and ancient past, tourists as well as locals visit this temple and enjoy the ancient sculptures. This temple is also associated with Ramayana. It is believed that when Ravana abducted Lord Rama's wife Sita, and he was taking her to Lanka, there was a bird, Jatayu who tried hard to rescue Sita from Ravana. According to the stories of the place, there is a footprint of Sita in the place and many devotees come to see this magnificent thing from the past. Also read: Bangalore - Nandi Hills - Lepakshi: A One Day Road Trip! Very close to the Veerabhadra temple, is another beautiful attraction of Lepakshi. It is the mesmerizing idol of Nandi the bull, which is made up of granite. The size of the Nandi bull is 4.5 m tall and 8.23 m wide, which is the largest statue of India. It is a perfect example of brilliant craftsmanship and beauty.